THE CONCLUSION to this year-long event! Today our good friend Tim Wallace concludes his coverage of DC’s weekly event, The New 52: Futures End! If you missed the previous installments, click here! 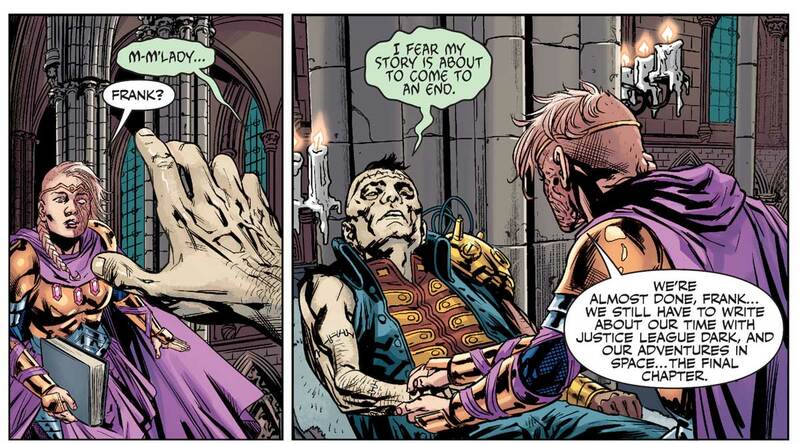 Warning, Tim’s entries contain SPOILERS for the related issues of The New 52: Futures End. Consider yourself warned! This is it, Match-Heads! 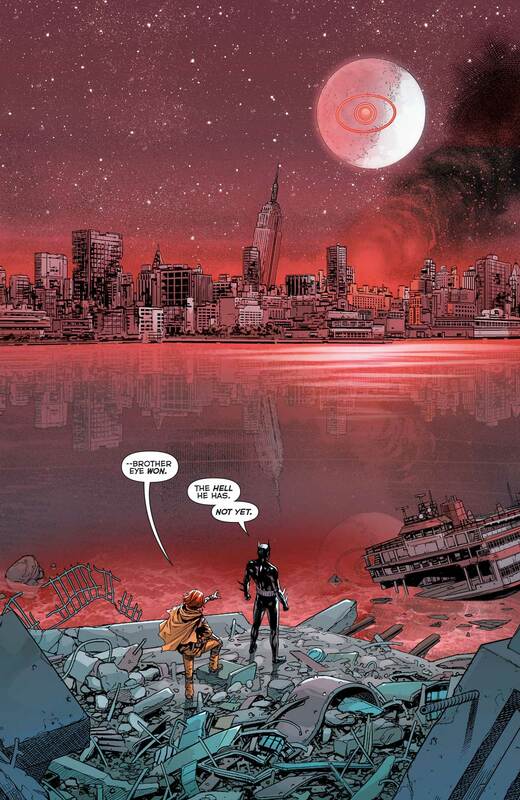 The final “Futures End” post. I really want to apologize it’s taken me this long to finish. To be honest it was a combination of things, but that doesn’t matter right now. The important thing is answering some questions. Will Batman and Mr. Terrific put aside their differences and raise their child, Brother Eye, together? Will Jason and Madison ever learn to separate, or will they be Firestorm forever? How will Superman shave that silly beard? Will all of this blend right into the already finished “Convergence” and not really matter? Find out all this and more, on the finale of “As the Daily Planet Turns”! Five years from now in New York, all hell is breaking loose. Brainiac has captured the city under one of his domes and is in the process of airlifting it off the planet! 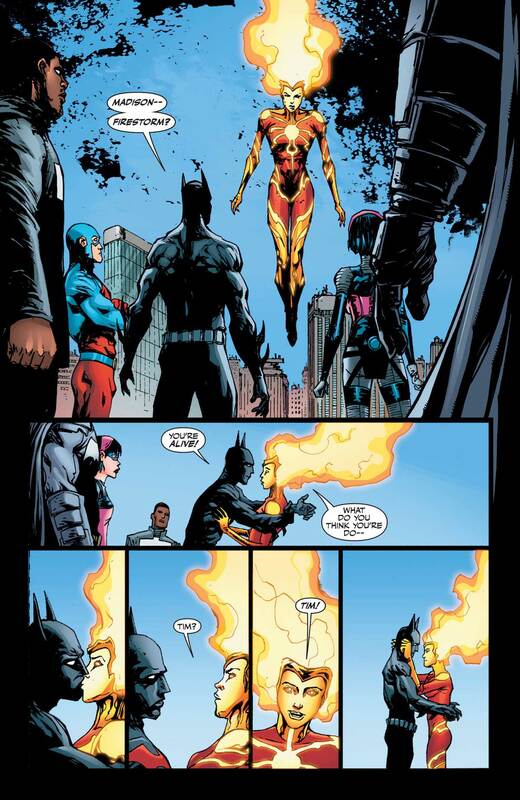 Firestorm and the Justice League are doing their best to prevent casualties. 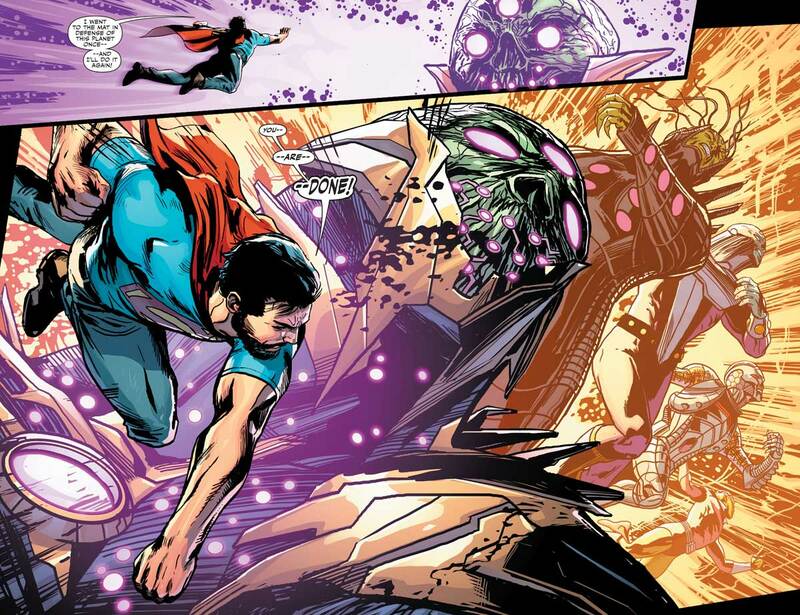 Superman tries taking on Brainiac with brawn, and manages to throw a punch that momentarily splits Brainiac into his multiversal components. While the villain tries to restore his systems, Batman, Mr. Terrific and the Atom put their heads together and come up with another plan. 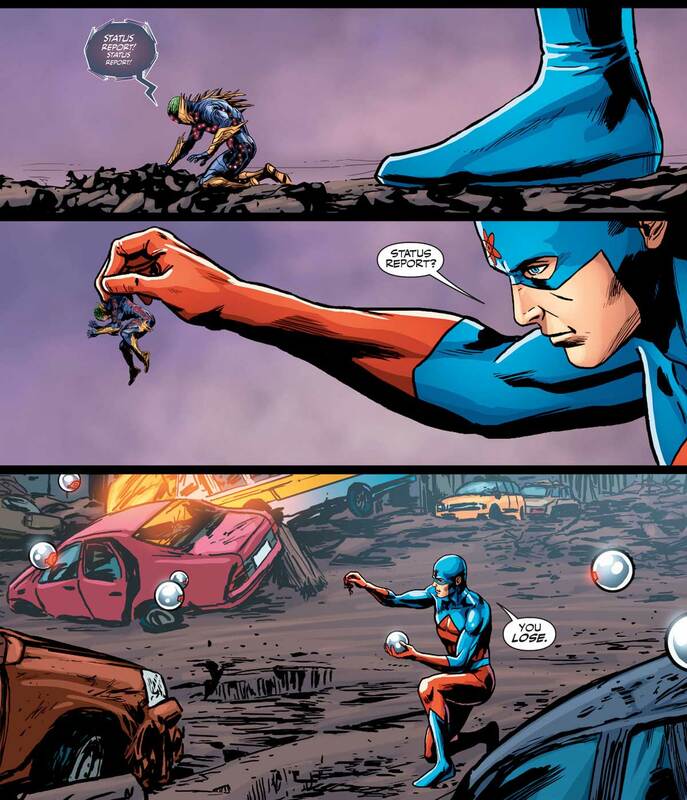 Covering Brainiac in Terrific’s uSpheres, the Atom manages to shrink both the spheres and the big baddie! The only downside? Without Brainiac in control, New York is falling! Luckily Superman is there to save the day! At Castle Frankenstein, Frank is on his deathbed, literally. As he lays, he speaks of all he’s experienced, and Amethyst writes down his life story…before he passes away. Before he goes, he inspires her to return to Gemworld as its princess. Back in New York, Polaris, Firestorm and Shazam continue search and rescue efforts while Superman takes Brainiac’s machines and throws them into the sun. Upstate, Faraday takes Boyer to a safe house…and promptly tasers him. Then, with Voodoo’s help, drags him to an underground bunker, Command D. Faraday sends Voodoo back upstairs, where she gets gassed by Rock and company. At Terrifitech, there seems to be a glitch. 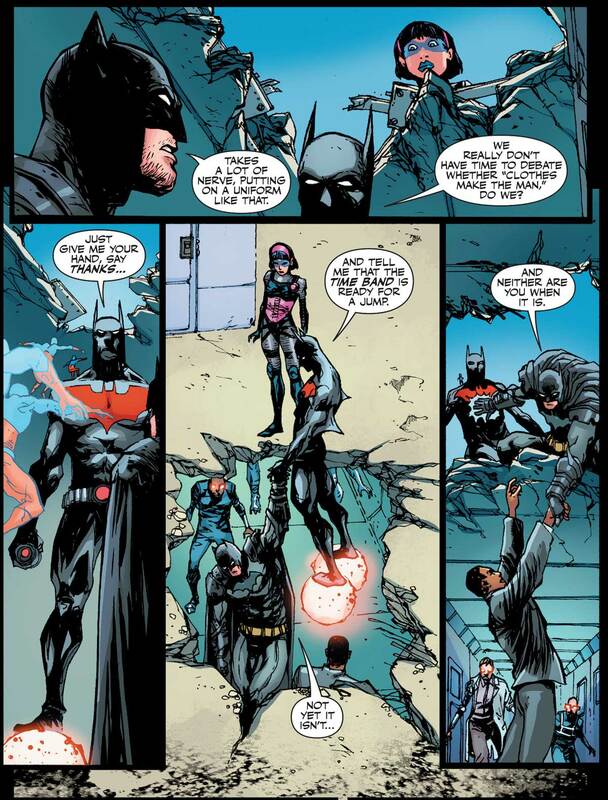 Batman, Terrific and the Atom try to get Brother Eye to disengage, but the computer refuses…it’s rewritten it’s protocols. 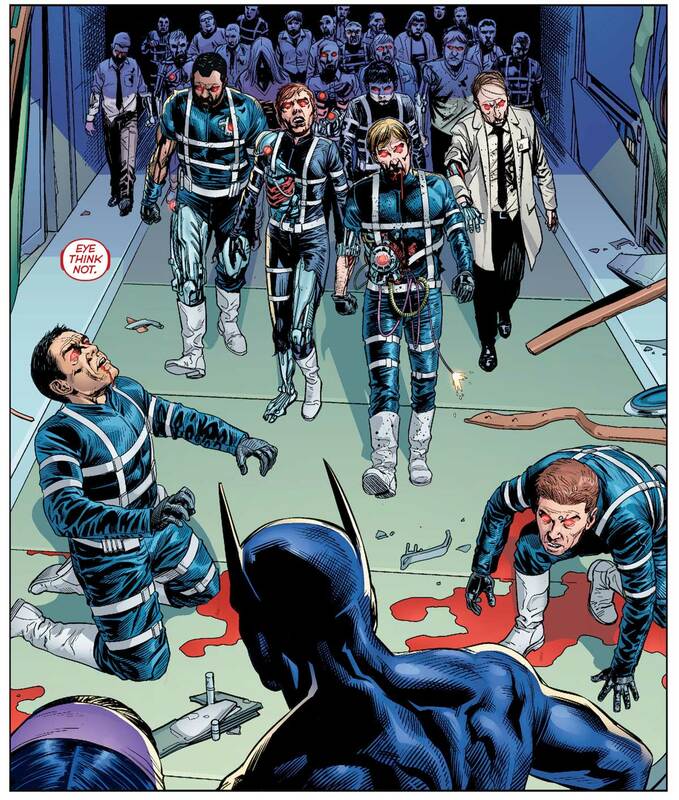 It begins shutting down systems in the tower, and as Batman Beyond and company make their way through the building, begins resurrecting the dead security teams as sort of proto-robo-bugs! Batman suggests cutting power, but Terrific already tried. Batman suggests the failsafe, but Brother Eye tells them it has disabled the self destruct. 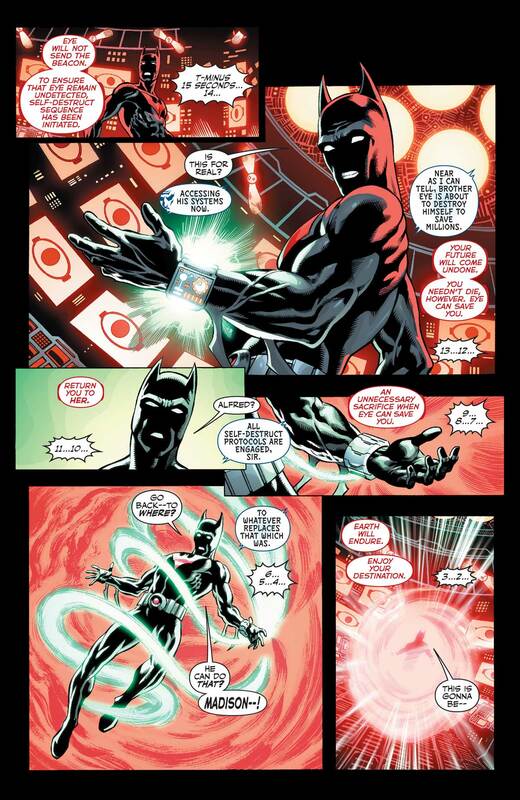 As Atom questions the A.I.’s motives, Batman Beyond appears to fill in what he knows. Back in Faraday’s safe house, Rock has made himself at home. He’s nestled all snug in his bed when he’s woken by E2 Lana. She’s paralyzed him. She doesn’t want to kill him…just give him a message. 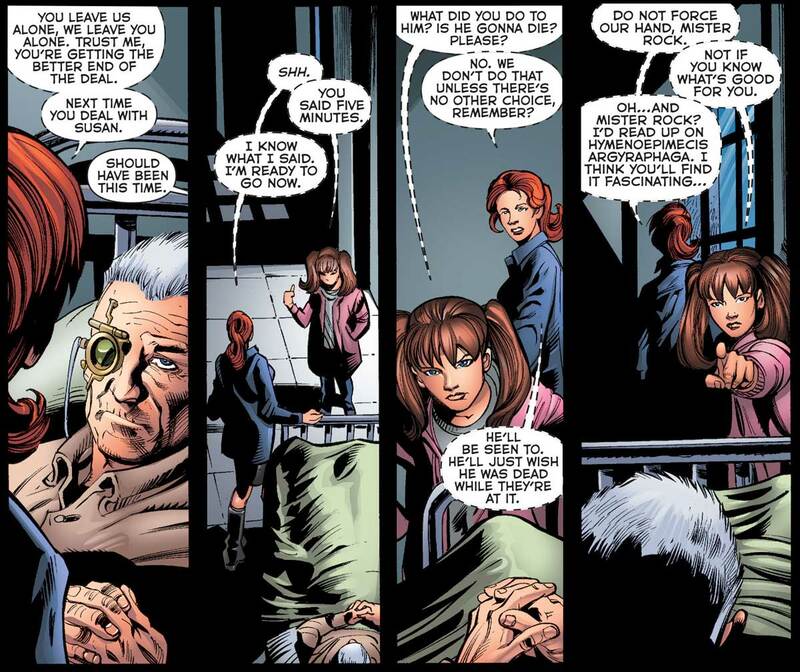 “Leave us alone.” She also reveals a secret…when she came from Earth 2, Cadmus labeled her normal, but she’s not. She can bond with insects and take on their traits…E2 Lana is the Insect Queen! They also warn that if he does mess with them, he’s dealing with Fifty Sue next time! 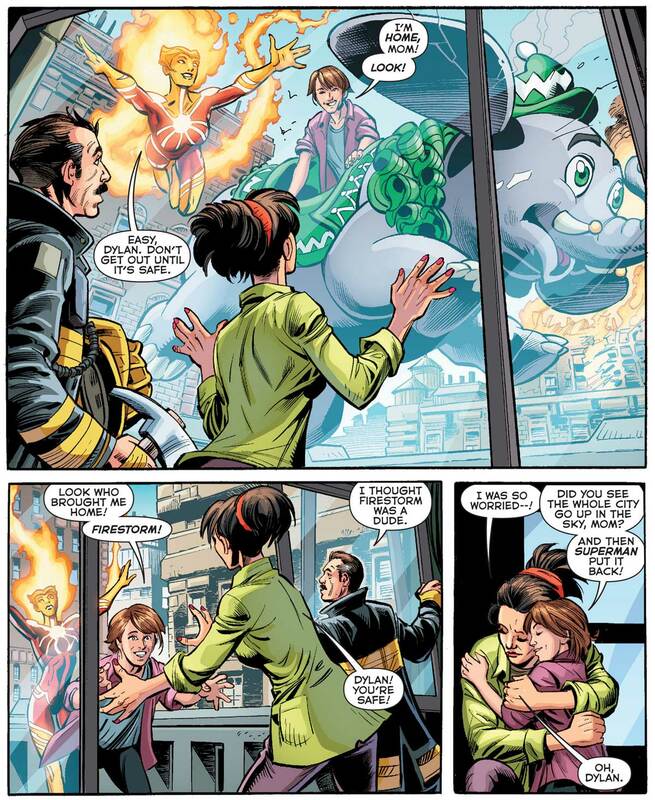 Firestorm has fully embraced the hero biz, reuniting a mother and child by way of a flying elephant! Madison and Jason are having a moment, discussing their inability to separate when their Justice League beeper goes off…they’re needed at Terrifitech! Brother Eye has the upperhand! It’s army of Cybermen have the heroes pinned down…and then “The Thing with Two Heads” shows up! Terry McGinnis manages to take it out, but is mortally wounded in the process. He passes the mantle of Batman Beyond to Tim Drake, and looks into the eyes of Plastique, “Please…be the last thing I see.” before he dies. Five years from now, Brother Eye appears on every TV, monitor, control panel…every device in the world to announce it is taking control. Batman and company haven’t quite given up yet. Though the odds are against them, and hordes of Brother Eye’s Borg army are closing in…one man is there to help…Batman Beyond! 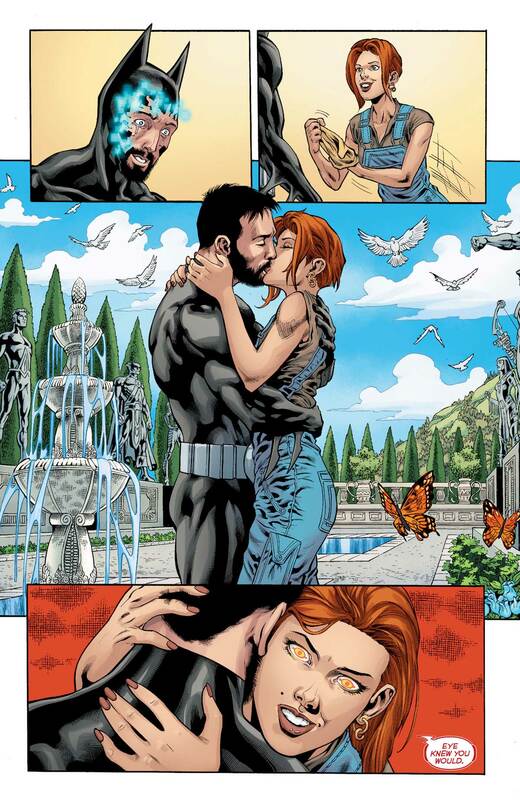 Batman recognizes Tim right away, Plastique is offended, and Madison/Firestorm on realizes who he is when they kiss. But the most important part is, he needs to time jump! Batman insists he’ll go until A.L.F.R.E.D. reminds them that the time band is calibrated to Terry’s weight…and Tim is a closer match than Bruce. 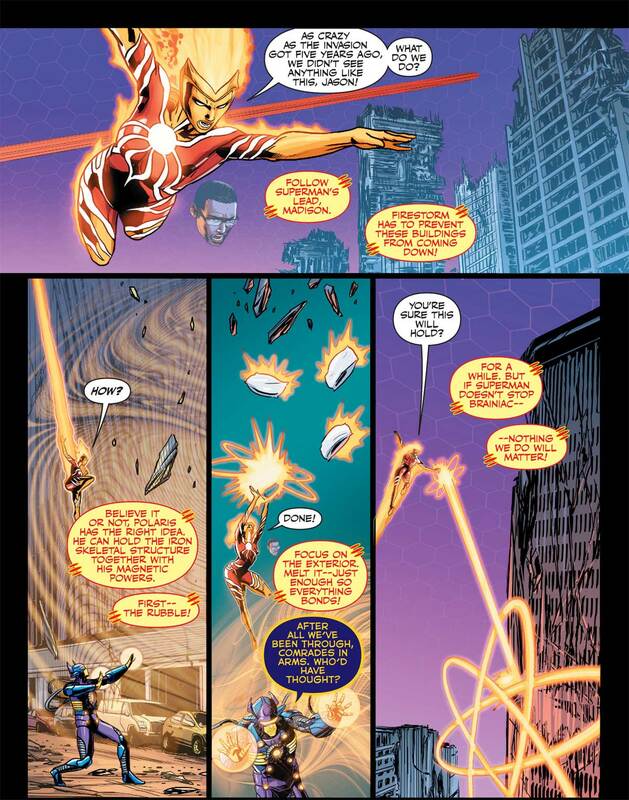 Terrific attaches jumper cables to Firestorm, yeah…jumper cables, so she can power the time band and in a blink Tim finds himself on the Brother Eye satellite. Then things get weird! He’s arrived “now”, or five years prior to the events of the other 46 issues in this series. The Earth 2 refugees, including Mr. Terrific, are on their way. Tim tries to plant explosives, Brother Eye tries to stop him. Tim explains what will happen, based on his future, if events are not changed. Darkseid’s parademons will follow the Earth 2 refugees and millions will die. Brother Eye accepts this to be true and offers to self destruct in order to save millions of lives. Before he does, he’ll even transport Tim back to Madison. Then Tim finds himself falling from the sky, landing in a forest…and he can’t believe what he sees! Tim has found himself standing in some sort of memorial park, surrounded by statues of heroes. He wanders looking at the heroes represented, and stops in front of Batman Beyond. And that’s when he sees Madison! “You came!” she exclaims as they embrace…then her eyes are replaced with Brother Eye’s symbol. She fades away. Everything fades away, leaving Tim in a room overlooking a devastated city with Mr. Terrific. They’re not in the past, or the present…but back to the future! Terrific has lost his marbles, and only appears to be alive and not assimilated because Brother Eye likes to keep “Father” around. Tim is not so lucky, he’s been flagged for cyber conversion and robo-Flash and robo-Captain Cold arrive to do the job. Until a mysterious figure blasts his way in! He’s soon followed by a small gun toting mob. He’s the Atom. They make their escape, Terrific in tow, and regroup at their base. This future isn’t all bad though, as Tim is reunited with a slightly older Madison, another member of the resistance. 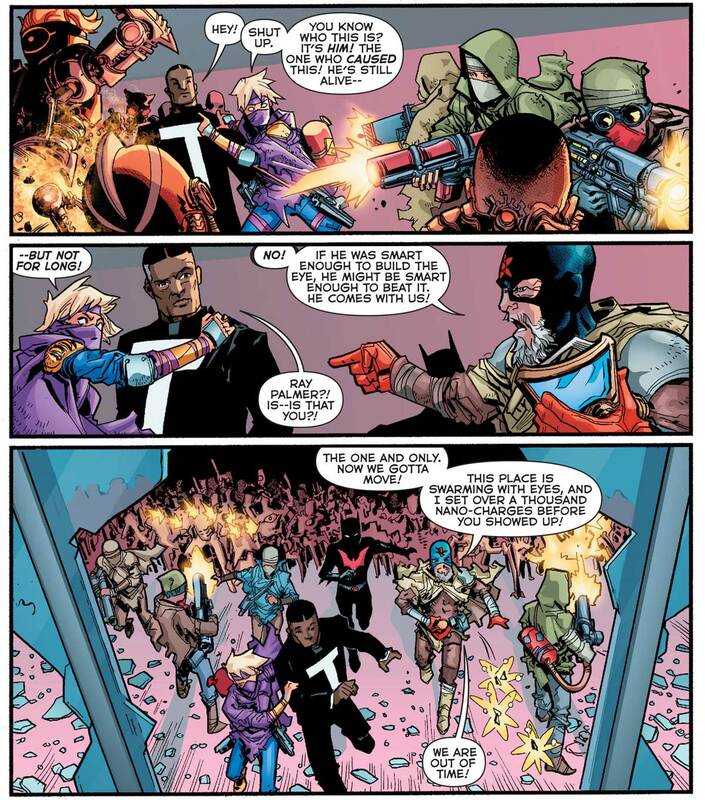 Tim’s ready to give all of this another chance…Madison, the hero biz, taking down Brother Eye…but the others aren’t so sure about that last one. As they look up to the moon, scarred with Brother Eye’s symbol, they think the battle’s lost…but Tim Drake isn’t convinced. Shag here again! What a long, strange trip it’s been! Let us know what you thought of FUTURES END in the comments. A very special thanks to Tim for this fantastic year-long coverage! Tim was the first “correspondent” ever featured here at FIRESTORM FAN and he did an exceptional job! A real shame he got converted by Brother Eye at the end. THANKS, Robot Tim! Posted in: Comic books, Dan Jurgens, Futures End, Jason Rusch, Madison Payne. I didn’t bother with the weekly and judging from the recaps I’ve read here, I’m happy ( & richer) that I didn’t. It seems to me that the Editors just aren’t on the ball and are putting out sub par material. I used to be a DC kid but had to drop all of my titles from them except for Aquaman, and even that title seems to be faltering with that new team to the series. Not too sure how I like the new Aquaman “action figure” with extendable Sword-to-Trident accessory included. Alas, that too may be dropped soon if the team fails to deliver what the 2 prior teams did. As soon as I hear that Dan the dIdiot is no longer DC’s main editor, I’ll probably start checking out the DC titles once again, but until then, I have to say no thanks. Also, considering that she appears to be eight, they imply she’s older and simply chooses to stay “eight,” even offering to show Lana her best rendition of 19. Wouldn’t this mean she is very clearly ALREADY ALIVE in the current, only five-years-ago DC present? Why did Rock and his girl-squad gas Voodoo? This feels like leaving a question open that we know isn’t going to be answered, since the series is over and Beyond takes place in the future. So wait…Command D is programmed to just NOT EVER OPEN AGAIN?! I think there might be one or two technical flaws in this idea. Is Ethan Bower supposed to be someone? He feels like he’s a reference to something, but he’s not Japanese Toyman, who is now Toymaster! WHAT HAPPENED TO KEY, COIL & PLASTIQUE?! They were setup with a decent storyline and trip at the ending when they run off and are just not seen again. Why does Tim think that Brother Eye won’t JUST DO whatever he wants anyways? Also, how is able to send him forward into the future?! Why is Father Time evil? I mean, he is BASICALLY just as much “evil” as someone like John Constantine, in that he/she is super-manipulative, but he’s not EVIL! In the end, it turns out he’s COMPLETELY IN THE RIGHT on Engineer! Why is him being a brain alien somehow negating his ability to run SHADE? Also…doesn’t his body change EVERY YEAR?! It’s been five! Where did John go? Yeah he picked up Superman, got his only two friends killed when they apparently had NO REASON to even be with him and after Superman flies off to save the day…nothing! I’ll admit I didn’t read ALL the one-shots so maybe they say there…Why is batman not involved anymore? What was this “trick” they pulled on Superman? Where are ALL the Green Lanterns during all this? Or ANY lanterns?! They couldn’t find a way to stop Brother Eye or the Parademons? I also like how King Faraday, DEFINITELY one of the biggest villains in this entire series, got NO COMEUPPANCE! Yeah, he’s in Command D, but…he got away with LITERALLY everything! He didn’t get the Vault and he didnt get his evil way, but he still ESCAPED ALL JUSTICE! 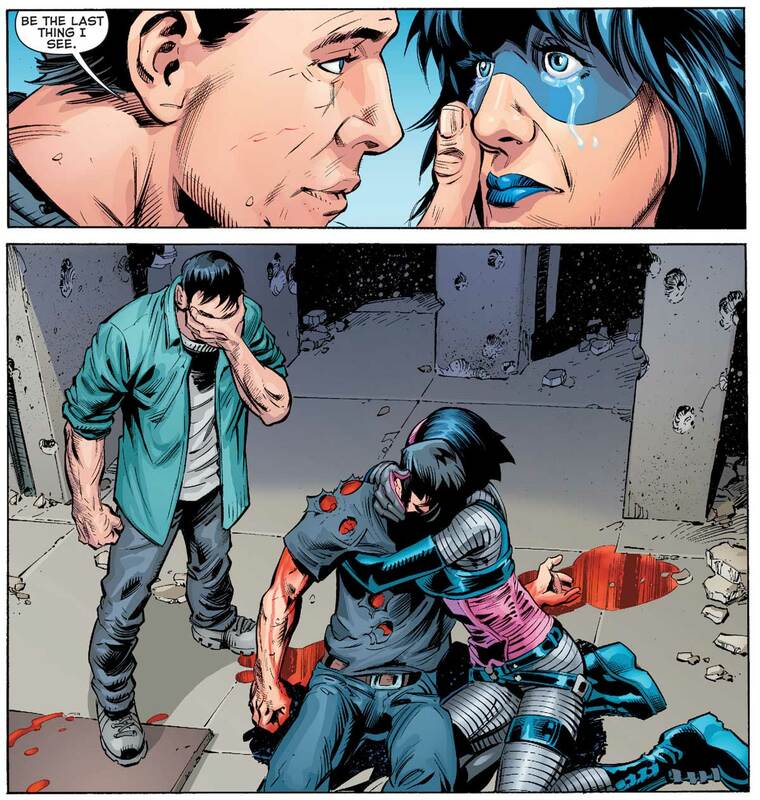 Did Lois actually say anything about the Cadmus crisis? I also still wasn’t sure if Rock was working for Faraday or vice-versa. Despite Brainiacs huge New York stealing setup being totally awesome…it sort of falls off when he has to turn it into A GIANT MOTORCYCLE to DRIVE NEW YORK HOME. I am still upset that this whole series’ legacy leads to 2 things: Convergence, which sort of tell apart on its own & Batman Beyond which looks a bit more like Beyondi, the Last Batman on Earth.